In the wake of heavy rains, at least 32,000 civilians staying in tents along the Turkish-Syrian border are awaiting humanitarian aid, locals told Anadolu Agency. 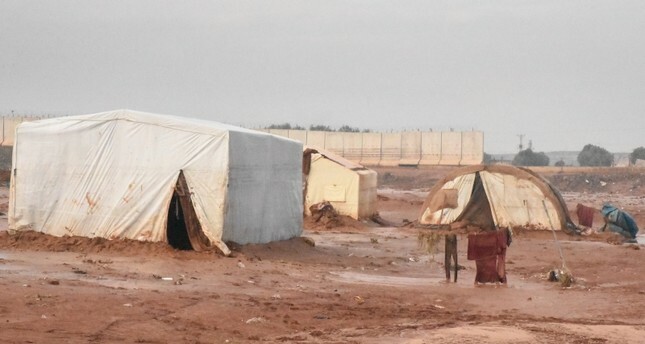 Since Dec. 22 at least 22 refugee camps were flooded and 67 others were badly affected by heavy rains in the Atmeh camps region, according to data collected by the Syria Intervention Coordinators, a local NGO devoted to helping civilians. At least 220 tents were demolished and 550 tents were flooded. Um Huseyin, a camp resident, told Anadolu Agency that he and his wife were rescued with the help of their neighbors. "Right now we're living in the mosque. Our neighbors brought us breakfast. Even the clothes I'm wearing now are from the neighbors. I'm freezing," he said. Huda Kasim, the mother of a 4-month-old, said that they also took shelter in the mosque along with 25 other families. "We're starving," she said. Another resident, Halit Abdo, 70, said that he rescued his children from the flood by carrying them on his back. The water level rose to 2 meters, he said. Usma Kasim said that one of the main needs in the camps is tents. "Medicine, food packages, and blankets" are other urgent needs, he added. Syria has been locked in a vicious civil war since early 2011 when the Bashar al-Assad regime cracked down on protesters with unexpected ferocity.